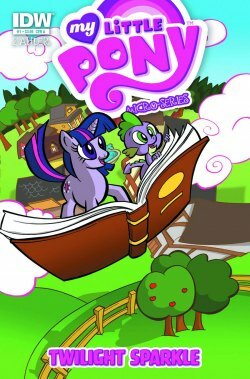 On the hooves of releasing the wildly successful My Little Pony: Friendship is Magic comic book tie-in series (which sold hundreds of thousands of copies while it was still in pre-order!) IDW have announced a new My Little Pony Micro-Series. Each of these six full-color issues while feature one of the “Mane Six” characters from the series in their own showcase adventure. First up is Twilight Sparkle — ably assisted by her dragon friend Spike, of course. “Twilight Sparkle becomes enthralled in a literary masterpiece. Dismayed to hear the series never continued, Twilight goes on a quest to hunt down the reclusive author, Jade Singer. The first issue was written and illustrated by Thom Zahler. Look for it in February, or pre-order it (before everyone else does!) at Mail Order Comics. Twilight Sparkle IS Annie Wilkes in "Pony Misery." The bestselling Earth Pony author from backwoods Mane, Crimson King. I'm thinking more Rainbow Dash would be Misery and the author would be the one who wrote the Daring Do series. Well, I was actually thinking Rainbow Dash would be Paul Sheldon, because she's like the Kenny of pony fanworks ("Cupcakes" and "Shed.mov" anyway), but then I was all like she didn't even like to read before the Daring Do episode, so she'd be a horrible author, but Stephen King wrote Misery, after all, and Paul Sheldon is clearly a King standin (the book was based on a recurring nightmare of his) and he sorta, kinda wrote himself into everything from the Marvel Universe to the Harry Potter novels in the Dark Tower series, after being asked by multiple fans to finish the series and then getting hit by a van and worrying himself that he might never finish the series, and, you know what, I better stop now because I am this close to writing My Little Pony/Dark Tower crossover fanfiction and that's terrifying. No no, do it, I would never have thought to mash my favorite author with MLP. Also, I really have enjoyed IDW's TMNT reboot (and it's character based Micro-Series), so I am looking forward to this. Basically, licensed stuff or otherwise preexisting stock is what IDW does; it's not exactly cutting edge, but has its place and they do alright with their borrowed properties (I also like their Godzilla series).